I’ve been in a bicycle accident. Do I have a case? To determine if you have a case, please don’t hesitate to contact us for a free initial consultation. Often times, the determination as to whether there is a potential case can be made with an initial phone conference, sometimes a face-to-face meeting is required, and in some cases, a two to three month investigation or accident reconstruction may be required. the injured person’s prognosis for recovery. hit by a car while riding my bicycle? The motorist’s insurance company doesn’t work for you. The motorist’s insurance company is in the business of making money. In other words, it is their goal to collect as many dollars as possible in the way of premiums, and pay out as few dollars as possible in the way of claims. This means they have an incentive to find reasons not to pay claims or to pay as little as possible. 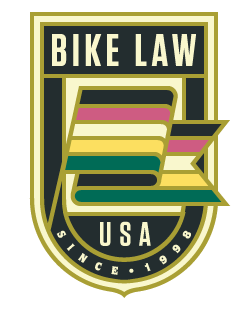 Without the potential of filing a lawsuit and having a jury or judge tell the insurance company they must pay what is fair, there is no reason for the insurance company to fairly compensate injured cyclists. How long should I wait before calling an attorney? There is no reason to wait before calling an attorney. If you call our office, the consultation is free. If it is too early to tell if a claim is warranted, we will advise you of that fact, explain what to look for, and likely instruct you to call back after a period of time. By making the call, there is no obligation to take any type of legal action. It is simply a way to have your questions answered and to be advised of your rights. How often do bicycle accidents occur? Published statistics indicated that approximately 40,000 to 45,000 cyclists are injured each year and that approximately 700 cyclist suffer fatal injuries each year. Most serious injuries occur as the result of bicycle/automobile collisions. The most common cause of bicycle/automobile collisions are crashes at intersections where the driver of a car simply isn’t paying attention or doesn’t see the cyclist. Accordingly, the best way to avoid a crash is to ride defensively and assume the motorist isn’t paying attention and doesn’t see you, even if you have the right-of-way. Another common cause of crashes in cities comes from motorists opening the doors of parked cars into the bicycle lane when a cyclist is approaching, causing the cyclist to crash into the door, or swerve to avoid the door and enter the path of passing motorists. Accordingly, when cycling in areas with parked cars, cyclist should be aware of whether motorist are in parked vehicles (and potentially preparing to exit the vehicle), and travel on the interior side of the bike lane. while I was riding my bicycle? While a violation of a law is a factor in analyzing your potential case, the fact you violated the law or received a ticket does not necessarily bar your claim. Most states have a legal doctrine known as “comparative negligence” which simply means that all parties are assessed liability for injuries based upon their respective percentage of fault. For example, if a cyclist is riding on the wrong side of the road, this will likely create some fault on the part of the cyclist. However, it does not excuse the motorist from liability if he/she was driving recklessly causing a collision with the cyclist.